Republican presidential candidate Donald Trump, at a town hall meeting Saturday in Aiken, South Carolina. In 2007, I woke up every morning — alarm set with a 1980s or ’90s TV show theme song — opened my computer and searched the term “poll” on Google. I did this through the spring, summer, fall and winter. And when I did, I saw the same person leading the Republican presidential contest: Rudy Giuliani. I thought Giuliani had a great chance of winning the nomination. You see, no Republican who had led for so long had ever lost the nomination: Ronald Reagan in 1980, George H.W. Bush in 1988, Bob Dole in 1996 and George W. Bush in 2000 — they all easily won. Giuliani, of course, didn’t come close to winning. Eight years ago, I didn’t know what I know now: Although Giuliani led the field, he was polling at only around 30 percent in the last couple of months of 2007, while all the previous nominees above were polling at about 40 percent or higher. That distinction is lost when you’re just looking at whether someone is a front-runner or not, and it’s why it’s a mistake to make too much of binary outcomes in small data sets. 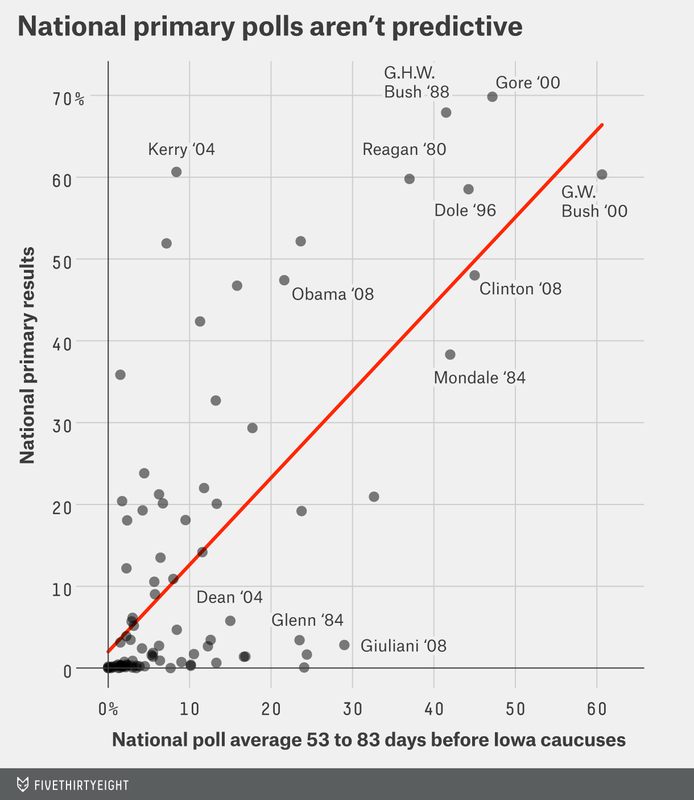 Beware pundits proffering “no candidate has ever lost when …” rules. It’s better to look at a continuous variable, such as how well polling in the past has predicted the eventual vote percentages of the candidates. If I had done that in 2008, I would have known that polls even at this stage in a primary campaign — a couple of months before the voting starts — still have a wide predictive margin of error compared with the final national outcome. Now, we have Donald Trump. He’s led in almost every national poll, with an average of 32 percent over the past month. He’s opened up a lead in New Hampshire, with 27 percent over the past month. And he may or may not lead in Iowa, with an average of 25 percent. These leads aren’t meaningless. But, historically, similar levels of support have been more likely to end with a share of the national vote that wasn’t enough to win the nomination. You can see this in the chart below, where for every candidate since 1980, I’ve plotted a monthly average of each candidate’s support in national polls a little less than two months before the Iowa caucuses against the candidate’s actual national primary results.1 I’ve included both Democratic and Republican primaries to boost the sample size, though it makes no difference to the conclusion. You can see there’s definitely a correlation. Six of the 12 eventual nominees were leading at this point in the national polls. But they were all polling better than Trump is now. Not only that, but 52 percent of the variation in the eventual results go unexplained. That’s a mathy way of saying that a lot tends to happen from this point on. There have been collapses: Giuliani in 2008 and John Glenn in 1984. There have been surges: Barack Obama in 2008 and John Kerry in 2004. Glenn, for example, consistently polled as well or better than Trump is nationally and in the early primary states, and Glenn fell off the map completely once voting began. Put another way, past campaigns suggest that 95 percent of the time, Trump’s eventual percentage of the national primary vote will be between 8 percent and 64 percent. And there’s reason to think Trump will end up on the lower end of that range. He doesn’t have a single endorsement from a governor or member of Congress, and those endorsements have historically been predictive of the eventual winner. What’s amazing is that polls at this point in the campaign are no more predictive than a January-to-June polling average from the year before the primary. The predictive margin of error is the same, as is the correlation between the national polls and the result. That may seem counterintuitive, but as we’ve said many times, voters simply aren’t paying attention yet. Yes, we are further along in the primary process, but voter attention only gradually ramps up; as my colleague Nate Silver has pointed out, voters start to really tune in after the Iowa caucuses. This is one reason I don’t put much stock in the argument that Trump’s lead is somehow more meaningful because it’s lasted this long. Winning a pretty meaningless metric for a long time doesn’t magically make that metric meaningful. Like with the national polls, there is a correlation, but there is often a large difference between what the polls say at this point and what happens. Again, this shouldn’t be surprising. What occurs in the Iowa caucuses will affect the New Hampshire primary, which will, in turn, affect future primaries. And even if Iowa and New Hampshire voters are paying more attention to the campaign at this point, they often wait until the final month and weeks before their contests to decide which candidates to back. What about candidates who managed to lead in Iowa, New Hampshire and nationally at this point?4 Four won their nominations comfortably (Reagan in 1980, Dole in 1996, Bush in 2000 and Al Gore in 2000), and Walter Mondale held on for dear life against Gary Hart in 1984. Two went on to lose: Howard Dean in 2004 and Hillary Clinton in 2008. A major difference between the winners and losers is that the winners were polling high across the board. That is, their support wasn’t just wide, it was deep. 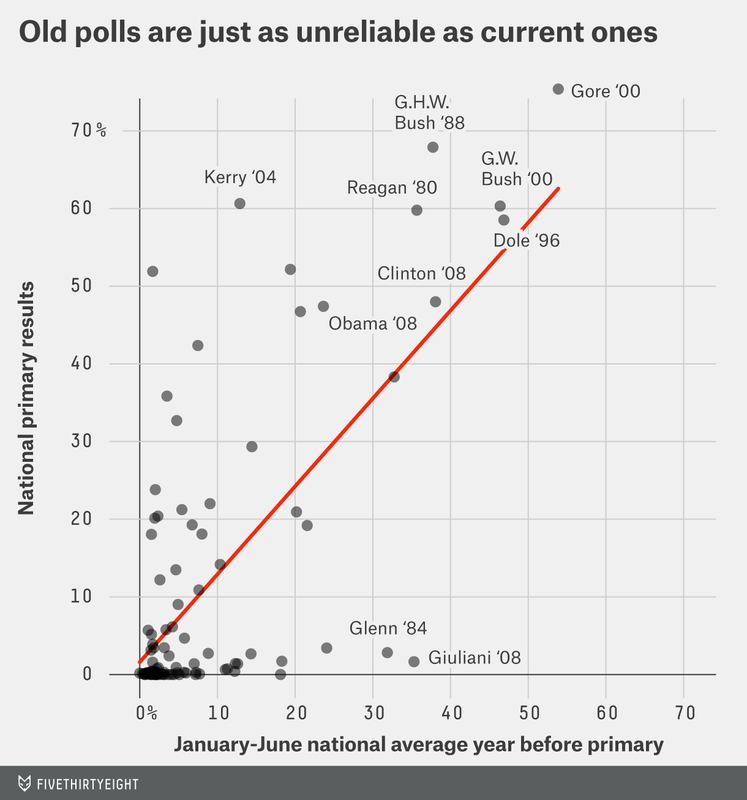 So are Trump’s polling numbers meaningless? No. As I keep saying, there is a correlation between the polls now and the eventual result. Trump could easily end up with 20 percent or 30 percent of the national primary vote based on his polling right now. He could also win. History tells us, however, that the current polls guarantee nothing, and Trump could stay a factional candidate, never expand his support and get passed by another candidate. Given that the GOP establishment will do everything in its power to stop Trump, I’m leaning heavily toward this scenario. Check out our live coverage of the Republican debate. We’re looking only at primaries without an incumbent president running for a given party’s nomination. For the 1980 campaign, I had to go back two months before this point in the campaign to get a poll. The inclusion of 1980 doesn’t alter the analysis. 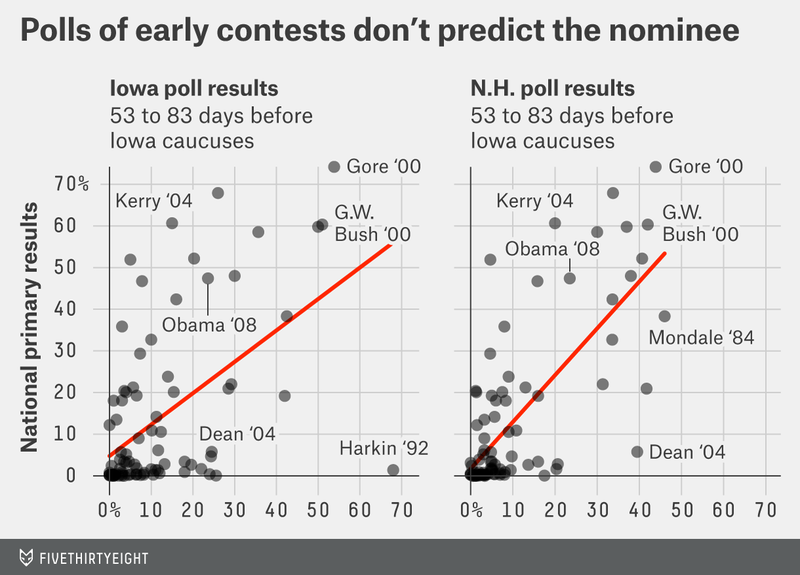 Putting national, Iowa and New Hampshire polls in one regression does not produce a more accurate forecast either. Ted Cruz is a hair in front in Iowa, according to the HuffPost Pollster and Real Clear Politics aggregates.